“Wow, Alli’s gotten a little pudgy there Josh.” This was the first thing my sister said when she came to visit me a few years ago and saw my normally trim 54 pound dog Alli. I looked at Alli and then back at my sister in disbelief. “She doesn’t look any different to me,” I said. Sure enough, I weighed her that same day – 62 pounds. I normally consider myself very in tune to the weight of dogs (as most vets are), but this completely snuck up on me. Seeing my dog every day, I just didn’t see her ~15% weight gain over the course of the year. Obesity is one of the most common things we talk about to pet owners during their pet’s annual exam. My goal in writing this post is to make you more comfortable determining if your pet is at a healthy weight, and if not, helping you get your pet there. Before I get started, it’s important to point out that obesity in pets is a common and serious problem. Recent statistics show that approximately 40-50% of pets are overweight. I’ll repeat that again because it is a shocking and important fact – 1 out of every 2 pets is overweight. That means 1 out of every 2 pets out there is at a significantly increased risk for arthritis or other joint problems, diabetes, etc. So, how do you determine if your pet is in the 50%? Looking at weight alone is largely unhelpful unless you’re comparing your pet’s current weight to previous weights. 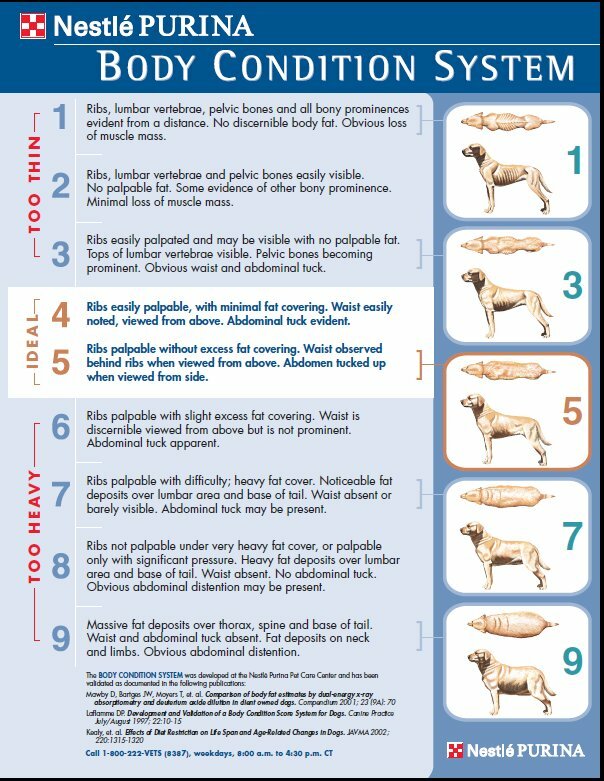 What veterinarians commonly look at is your pet’s body condition score. 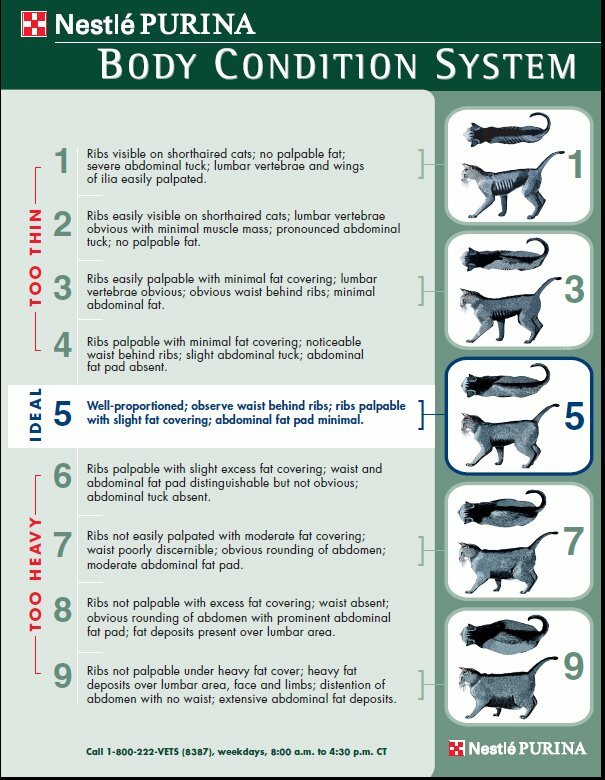 A body condition score (or BCS) looks at the distribution of fat, and appearance of certain parts of your pet’s body to determine if it is at an appropriate weight. At every exam, our veterinarians give your pet a score from 1-9 to determine if it is at a healthy weight. The scoring system (that was developed by Purina) is shown on the pictures below. A BCS of 5 (4 for some dogs who are prone to joint problems) is an ideal body condition. Using these pictures, you can grade your pet at home and determine if they are an ideal weight, underweight, or overweight. If you’ve determined your pet is a BCS 6, 7, 8, or 9, then read on! The weight that pets gain or lose is usually a simple balance of calories ingested versus calories expended. The simple solution to weight loss is to either decrease the amount of calories fed, or to increase the calories expended. Increasing calories expended is the easiest to talk about because it is accomplished by exercising your pet more. For dogs, something as easy as a 20-30 minute walk every day can help burn calories that they aren’t burning if their normal day involves sitting around the house. Light, frequent exercise is better for overweight dogs than intense, infrequent exercise such as a 3 mile run or hike once a week. Exercising cats can be a bit more difficult. One tip is to hide some kibble from their normal meals (if on dry food) around the house in difficult to reach areas. This will make them be active and “hunt” for their food during the day. If your cat plays with toys, interacting with them to get them moving a few times per day is helpful. Laser pointers can also be great exercise for cats as well (use caution with dogs as I’ve seen dogs develop obsessive compulsive type behaviors). If you know your pet isn’t getting as much activity lately, the easiest and healthiest thing to do is exercise! By far the most common reason pets are overweight is excessive intake of calories. It’s important to understand about how many calories your pet needs, and how much you’re providing with their normal meal. The following chart is a good approximation of the amount of calories required per day for an average (spayed or neutered) dog and cat. This can be adjusted up or down depending on your pet’s activity level. Many bags of dog food will list the amount of calories in each cup somewhere by the nutritional information. Let’s take a 40 pound dog for our example and a bag of dog food. This particular food contains 340 calories per cup (listed as kcal/cup) and the bag recommends feeding our 40 pound dog 2-2.5 cups per day. This gives 680-850 calories per day which matches up nicely to our chart. Now think about the extra things your pet gets during the day. Let’s give our 40 pound dog a pig ear today. That’s it, just a single pig ear. That pig ear has 230 calories. That’s equivalent to a normal human drinking 6 – 12 oz cans of cola at a whopping 840 calories. OK, that may be too much you think, how about a dental chew that you picked up from the store. Most dogs get something like this every day. At 90 calories, that’s equivalent to you eating a hot fudge sundae every day of your life, at an extra 330 calories per day. With even regular, moderate calorie treats; it’s easy to see how the extra weight can sneak up on your pet. It’s even more dramatic for a 10 pound dog, where even giving a single biscuit at 40 calories is like you eating 2 doughnuts. So my recommendation for helping decrease your pet’s caloric intake: eliminate the moderate or high calorie treats, stop feeding unhealthy table scraps, and try giving your pet healthier, lower calorie treats. See if your pet likes carrots, celery, or small pieces of plain rice cake. Try buying canned food and cutting it up into small bites and freezing it to use as treats. Some pets even like ice cubes! At the very least, look for a lower calorie treat, your pet probably won’t know the difference! The key is realizing that although we like to show love to our pets by giving them treats and table scraps, if given improperly, these are the things that contribute the most to pet obesity. A quick word about diet foods – many over the counter foods are marketed as “light” or “healthy weight” foods. These foods may have slightly lower calories per cup and a higher fiber content to make your pet feel fuller, but simply switching to these light diets alone rarely accomplishes weight loss. You’ll be happy to know that my dog Alli is now at 53 pounds and a BCS of 4.5/9, but it was so easy to lose track of her weight, how much she was eating, and her decreased exercise, and before I knew it she was overweight. So I encourage all of you to look at your pets, using the Body Condition Score, try to determine if they are overweight. Look at what they really eat during the day, look at the exercise they get, and see if you can make any changes. If you are unsure of things, have questions, or need help, call your veterinarian!